Completed in 1966, the boiler house in Ballymun was the largest civic heating scheme in Ireland and the United Kingdom, using a 200,000-litre reservoir to supply fresh water and underfloor heating to 3,000 flats in the town. The flat complex was demolished as part of a wider area regeneration plan between 2004 and 2015 and the boiler house itself was decommissioned, pending demolition, in 2010. 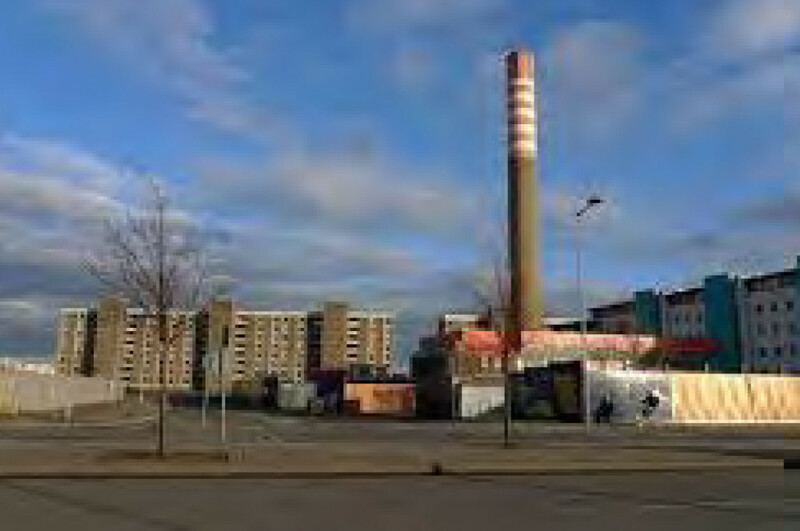 In 2011, Dublin City Council, Ballymun Regeneration Ltd and the Rediscovery Centre (a local social enterprise) began a joint project to reinvent the site and create something unique in Ireland. The renovated building would become an exhibition centre for sustainability – a ‘3D textbook’ in which best practice reuse and green construction methods would be encoded into the texture of the building and its surroundings. 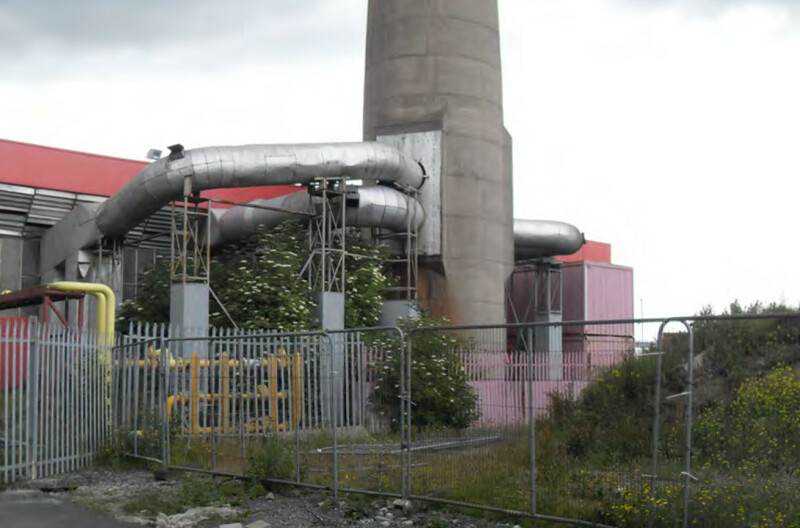 On completion, the boiler house would also become home to the Rediscovery Centre, helping to bolster its suite of innovative waste reuse enterprises and to extend its community employment and training schemes. In 2013, the project secured funding from the EU’s Life and Environment Fund and gained a new name: WISER (Working with Industrial Spaces to Exemplify Reuse). 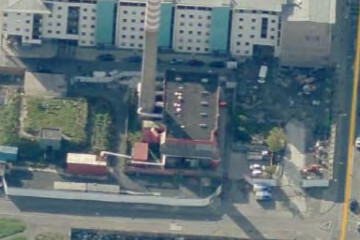 The redevelopment of the site was offered for tender in 2014. The brief specified that the building must incorporate innovative and renewable technologies and platforms that could be applied at a European level and with the potential to inspire, inform and lead positive behavioural change among visitors to the site. The repurposing of the building was offered for tender mid-2014, and the brief specified that the building must incorporate innovative and renewable technologies and platforms with the potential to educate and influence the behaviour of its visitors which can be applied at a European Community level. ABK Architects of Dublin were awarded the contract and worked with Purcell Construction, Punch Consulting (structural engineers), Homan & O’Brien (service engineers), Stephen Diamond Associates (Landscape Architects) and Aecom (Quantity Surveyors) to deliver the new building. The first spade was struck in March 2016 and the building was completed by December 2016. A core ambition of the project was to demonstrate the environmental value of reuse over demolition. Construction materials were therefore according to an ordered prioritisation, with top priority given to materials salvaged from the boiler house itself. To this end, the construction team retained the boiler house’s original concrete floor slab (some five metres thick) and the main steel structure. ABK Architects estimated that these actions alone resulted in a saving of 55 tonnes of embodied carbon. Where materials were not available onsite, the next priority was to find them as locally as possible. For example, the interior glass of the building was sourced from a scrapped local building scheme. The third priority was to use sustainable, natural, renewable materials or material made from recycled waste. An obvious example is the exposed hempcrete insulation on the east and south-facing walls of the building. Hempcrete is an admixture of hemp and lime shiv, which when baked in a wooden frame, hardens into a brick-like material that is both more thermally efficient than concrete and more permeable. 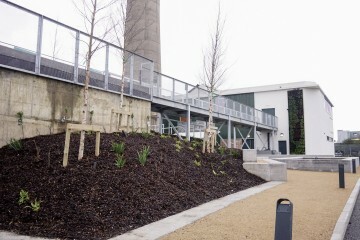 The Rediscovery Centre is the first public building in Ireland to use this material. Where the first three criteria could not be fulfilled, construction materials were chosen on the basis of their thermal performance, low embodied carbon and environmental impact. The result was a structure with a Building Energy Rating of A2: almost unprecedented for a renovated building. The concentration on sustainability is also apparent on the building exterior. Thermal and photovoltaic solar panels have been fitted to the roof to provide heat and electricity respectively, with the aim of ensuring 80% energy self-sufficiency. Similarly, wastewater and rainwater are recycled: first being by cleaned in a dedicated plant room, and then by being pumped to an exterior filtration system that removes particulate matter and aerates the water for reuse. The water is then returned to the building. The heating technologies within the building are coordinated by a building management system (BMS) installed by Control Tech Ltd. The system is calibrated to select the most efficient single technology – or combination of technologies – to run the building at any given time. The BMS takes its cues from an onsite weather station measuring temperature, relative humidity, barometric pressure, rain intensity, wind speed and wind direction. The BMS can be used to coordinate the building’s electricity use: balancing between solar inputs and the onboard Combined Heating and Power system. Recycled paint from the Rediscovery Centre’s Rediscover Paint project was used throughout the building having been salvaged from nearby recycling centres. Furniture and fittings also destined for landfill were upcycled and reused to furnish the building. Wherever possible materials were specifically selected based upon their ability to demonstrate best practice reuse, recycling or recovery.